Thank you HSN for sponsoring this post. While this was a sponsored opportunity from HSN. All content and opinions expressed here are my own. August marks one of my favorite parts of the year in Michigan — peach season! When you think of peaches, you probably think of Georgia first, but Michigan grows absolutely fantastic peaches. It’s always exciting to see the home-grown goodies showing up in my grocery store in the late summer. 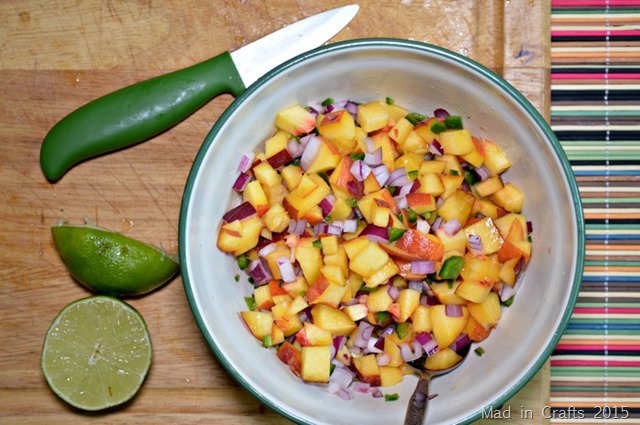 Although my favorite way to eat Michigan peaches is just to bite right in, I turned my first peach haul of the year into this sweet, spicy, and savory recipe. 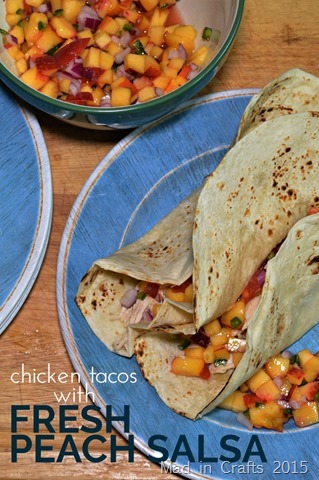 I kicked up plain chicken tacos by adding freshly made peach salsa. 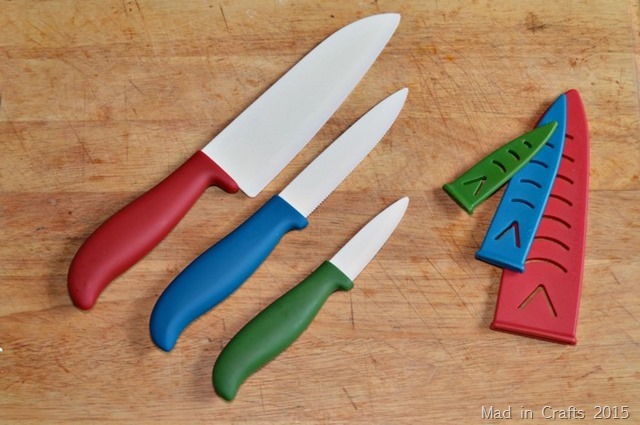 Right now, HSN is carrying a line of Margaritaville products, including this Margaritaville 6-piece Ceramic Knife Set. 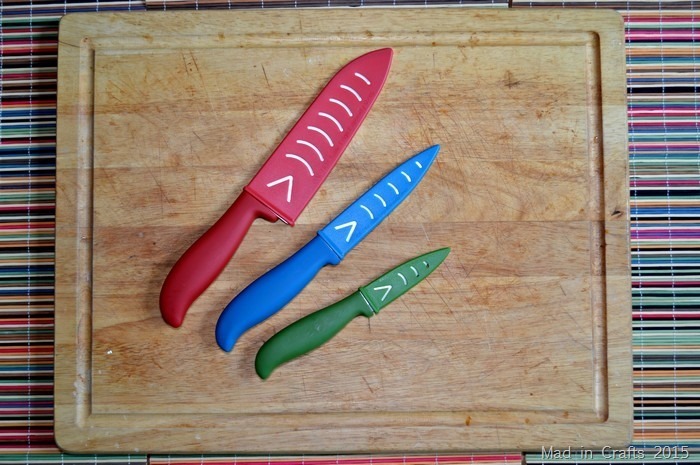 I had never tried ceramic knives before, so I was intrigued and wanted to try them out. The set comes with three knives with ceramic blades and plastic sheaths. I used the large chef’s knife and the small paring knife for my salsa. The white blades kind of make the knives look like toys, BUT THEY ARE NOT. That chef’s knife cut straight through the lime with hardly any pressure on my part. Sucker is sharp! I used the knives to slice and chop up all my fresh ingredients, and then let all those flavors hang out while I made the tacos. I cooked up my chicken breast and shredded it with my hand mixer (the greatest kitchen trick ever). I think the secret to making store-bought tortillas taste fresh is to char them over your gas burner before serving them. 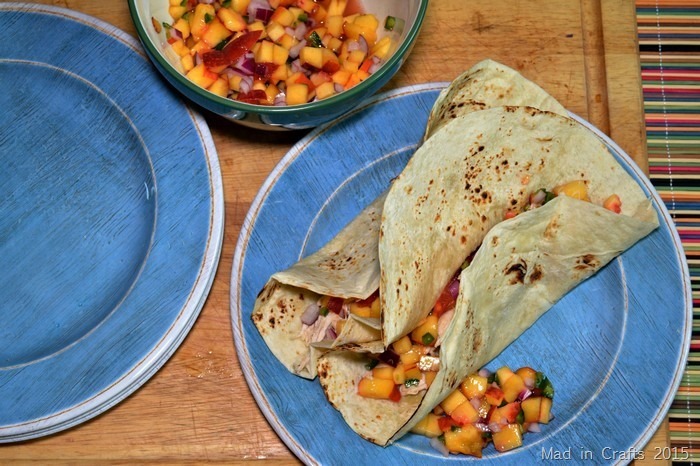 Just get a little bit of bubbling and charring going, and you add great smoky flavor to the tortillas. I added some shredded chicken and peach salsa to my tortillas and plated them up on the Margaritaville Dinner Plates. The ocean blue plates look fantastic against the colorful salsa. HSN also sells matching Salad Plates. Each item in the HSN Margaritaville collection is designed with the Margaritaville state of mind of escapism, relaxation, and paradise… where it’s always 5 o’clock somewhere. During the month of September, you can get $15 off your next order of $75 or more using the code 154295 at HSN.com! 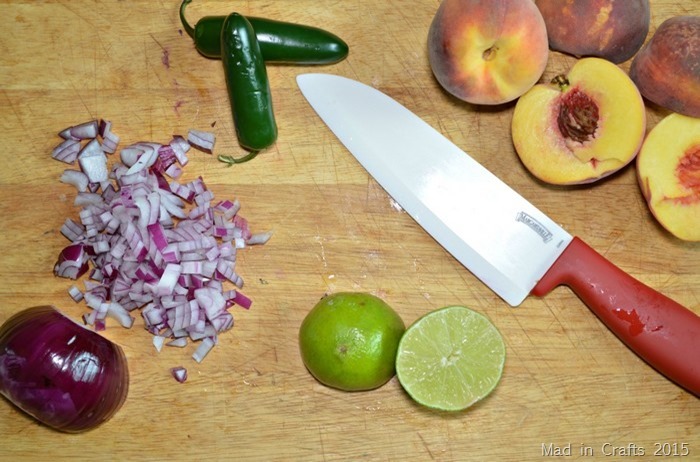 Dice peaches, onion, and jalapenos. This looks AMAZING! Will have to try these (and I LOVE those blue plates–so pretty). We have peaches on our GA license plates but our peaches are crap . . :0 I’ll have to get some MI peaches to try this!